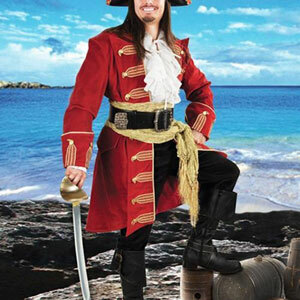 Captain Morgan Pirate Coat for sale is made of a handsome blood red velvet material. This stunning jacket has a matching red cotton lining and features attractive gold rope trim that has been hand applied. The coat is accented with striking brass buttons. The Captain Morgan Pirate Coat can function as an eye-catching costume for parties, Pirate Fest or Buccaneer festivals. Or keep it for years as the perfect Halloween costume. Buy the Captain Morgan Pirate Coat for $189.99. 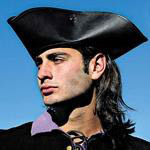 Tricorn Pirate Hats for sale features the popular triangular shape. These hats are manufactured of top grain leather making them the perfect companion to any pirate or buccaneer costume. The leather has a weathered, dark brown finish which gives it a truly authentic appearance. The Tricorn Hat is available in two sizes. The S/M features a 23 inch approx circumference. The L/XL has a 26 inch approx circumference. Buy the popular Captain Morgan Tricorn Pirate Hat for only $79.99. Skull and Crossbones Leather Pirate Hats for sale is fit for a true buccaneer. This variation of a traditional pirate tricorn hat is crafted of fine black leather and features antiqued brass skull and crossbones. These pirate hats are offered in two sizes. Buy the Skull and Crossbones genuine leather hat fit for any pirate or buccaneer for $79.99. Pirate King Belts for sale is manufactured of faux snakeskin. 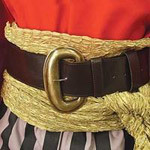 These belts will complement any buccaneer, swashbuckler, Captain Morgan or pirate costume. 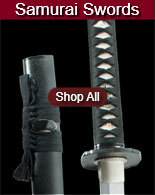 They have an antiqued nickel buckle and tip. 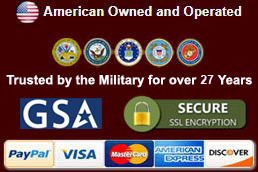 These popular belts are 48 inch in length and three inches wide. Buy the Pirate King Belt for $89.99. Captain Costume Sash for sale is the perfect companion for any captain, swashbuckler, buccaneer or gypsy costume. The sash is available in a variety of colors. 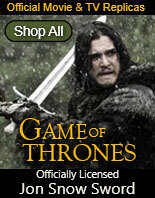 They are 96 inches in all and manufactured of beautiful metallic polyester. They feature multiple tassels on the edges. 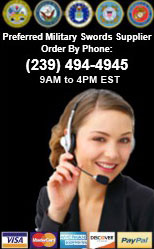 Buy the Pirate Costume Sash to accent any pirate costume for only $59.99. Skull and Crossbones Pirate Flintlocks for sale are non-firing display replicas. These flintlocks are 13 ¾ inches in overall. They feature a wooden stock and have an antique iron finish on the cast metal barrel and fittings. 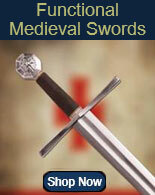 Pair these non-firing flintlocks with a sword for a beautiful display or a unique costume. These popular pieces are made in Spain. 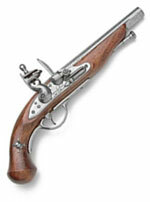 Buy these functional, non-firing flintlock replicas for display, theatre, stage or movie prop use.